Click here to register for any of these seminars. At Wilkins RV one of the most important things to us is making sure you’re educated and equipped to handle your RV’s care. These are homes on wheels and, as a result, require more care than just the regular family mini van. 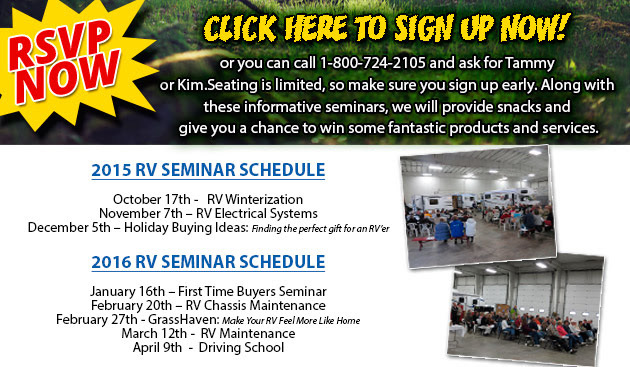 We’re proud to be hosting three RV seminars in the coming months, along with several in 2016. These seminars are friendly, free and most of all educational. They’re a safe space to answer any questions you might have and meet other RVers. On October 17, we’re hosting our RV Winterization seminar. This will teach you the ins and outs of winterizing your RV. We’ll offer money saving tips and ensure you know how to get the job done, so your RV avoids costly damage that often occurs when winterization is done incorrectly. Bring a notepad and join us for a seminar that you’ll be grateful you attended. November 7, we will be discussing RV electrical systems. If you’ve ever wondered how to avoid busting fuses or how to replace a fuse, or have any other questions related to your RV’s electrical system, this is the seminar for you. The last seminar of 2015 will be held on December 5. We’ll offer tons of great gift ideas for the RVer in your life. This is also a fun seminar to attend if you’re looking for things to put on your holiday list. After the holidays we’ll be hosting a seminar on January 16, that covers RVing for the new RVer. If you’ve never RVed or know someone who is interested in learning more about RVing, then this is the perfect time to come in from the cold and discover a hobby that will take you places you used to only dream about! One of the most important parts of owning a RV is maintaining its chassis. On February 20, we’ll offer tips on how to maintain your chassis so you can get the most out of your RV and avoid costly damage. Additional topics include oil and oil filters, air brakes and improving gas mileage. As the spring RVing season arrives we’ll be offering a RV maintenance seminar on March 12. You’ll learn how to avoid costly breakdowns by simply maintaining your RV from the start. We’ll walk you through what manufacturers recommend and how to take care of these tasks. If you’re looking to buy a motorhome, but aren’t quite confident in your driving skills, then our April 9, driving school seminar is for you. We will help you gain the confidence needed to get behind the wheel of your new motorhome.